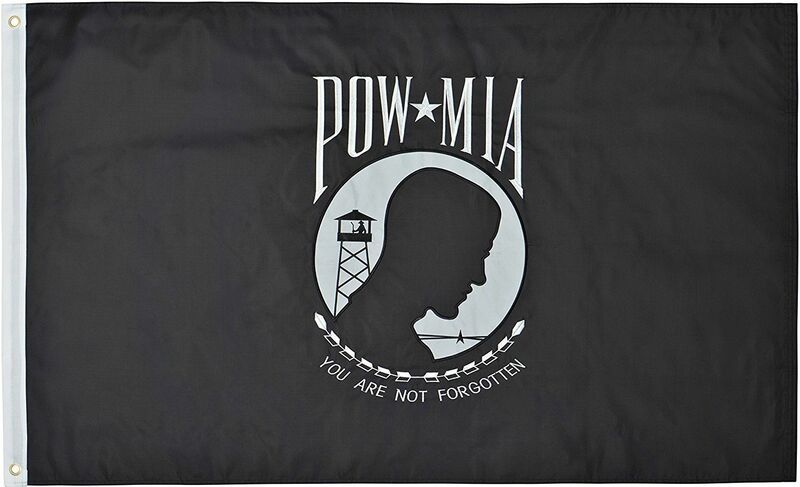 Our nylon POW/MIA flags are the best money can buy. These SolarMax POW flags are made of an extraordinarily durable nylon that stands up to high winds, bright sunlight and UV rays. These flags feature a dense 200 denier nylon weave and premium quality stitching. They are also backed by our one-year colorfast replacement guarantee. Available in all sizes! These are single reverse flags, which means that the same image displays on both sides of the flag, versus our double-sided POW-MIA flags on which the image shows correctly on both sides of the flag. While the double-sided flag is considerably heavier than the single reverse flag, it doesn't fly as easily as the lighter alternative.